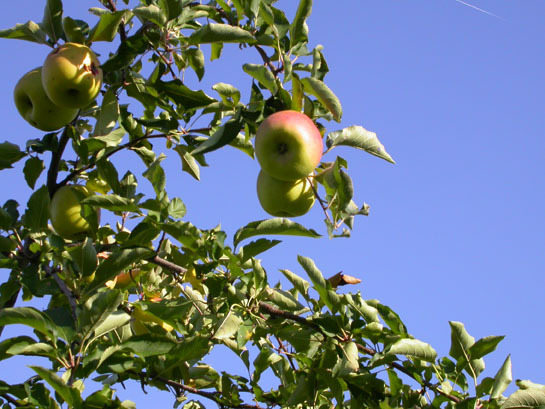 This past weekend, I went apple-picking with my sister and her family and another family. It's a somewhat loose tradition where fall comes around and we pick apples and take lots of photos of the kids, the landscape, what have you. 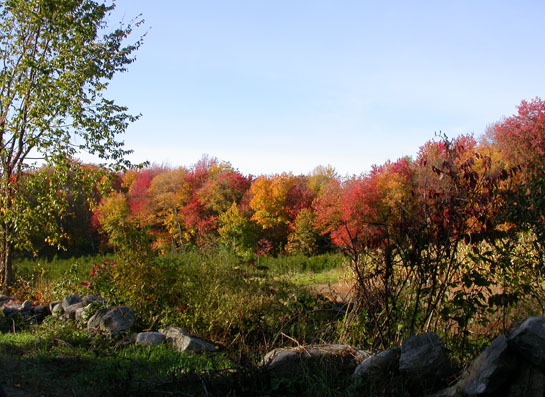 We've been going to the the same place over the last few years, Honey-Pot Hill Orchards in Stow, Massachusetts. It's about 45 minutes outside of Boston. There was quite a huge crowd at the orchard. Apparently everybody else in eastern Massachusetts thought it might be a great idea to spend the weekend outdoors picking apples, eating apple donuts, drinking mulled cider, feeding an assortment of farm animals, etc. It took us about 35 minutes just for the privilege of filing into the parking lot. Luckily the weather was spectacular and the scenery was lovely -- hence the image above. My sister has a fondness for Mutsu apples. My apple-tasting palette is somewhat undifferentiated. Truth be told, I don't even like fresh apples all that much. I like apple pie, apple betty, apple crisp, apple cider, apple juice, apple sauce, apple butter -- but I'd have to be starving to eat a whole apple. Every time I bite into an apple I always feel I might dislocate my jaw. One thing I won't deny, they are LOVELY. It's just fun to be out and about with friends and family, enjoying the last of the beautiful weather and landscape.